Owen Ogletree's Pub Crawl for the best pubs, beer bars, and brewpubs in New Orleans, Louisiana. Brewtopia Events LLC, www.ClassicCityBrew.com, the Atlanta Cask Ale Tasting and Classic City Brew Fest are operated by Owen Ogletree of Athens, GA. Owen is a BJCP National Beer Judge, beer traveler, award-winning homebrewer, and beer columnist for Southern Brew News and Athens Magazine. Photos and text by Owen Ogletree - updated in June 2007. New Orleans is one of the most exciting, unique, and European cities in the United States -- it glows with personality and energy that are utterly amazing. Millions of tourists head there each year to savor the spicy foods, discover the history of the city, and experience the carnival atmosphere that rules this town. Since there is so much to see and do in New Orleans, it is unfortunate that many tourists spend all their time in the old town (French Quarter or Vieux Carre´). While the French Quarter is remarkable, the beer aficionado will find some enticing pubs outside this area -- out in the neighborhoods away from the touristy sound, fury, and debauchery of Bourbon Street. Because of the charm of each pub and the fact that many spots serve beers that are quite potent in regard to alcohol content, this pub crawl may take more than one day. Many pubs also have great music. Divide this crawl up in any way you wish to allow plenty of time at each spot to fully enjoy the “Big Easy” atmosphere of these New Orleans beer destinations. Get a street map of downtown New Orleans, make sure you have four one dollar bills and four quarters in your pocket for the streetcar, and prepare yourself for a scenic ride and some incredible beer. Canal Street serves as the major thoroughfare separating the older French Quarter on the northeast from the newer Central Business District area of downtown on the southwest. 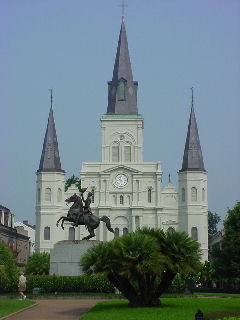 Get to the corner of Canal and Carondelet (across from Bourbon Street). Here is where you will board the old streetcar that will rattle its way past glorious mansions down St. Charles Avenue toward your first beer. NOTE: As of June, 2006 the St. Charles streetcars were not up and running again, so you will have to take a bus out St. Charles or a taxi to the first pub. artists (see their new section listed below). The St. Charles streetcar (see streetcar note above) is a noisy ride with no air conditioning that only costs $1.25 each way, but it provides one of the most convenient and enjoyable ways to get out to two of New Orleans’ best beer pubs. Get off your streetcar at Louisiana Avenue (just past Washington) and walk back across the tracks down Louisiana five blocks. Go left on Magazine Street about two blocks, and you’ll see the Bulldog pub on your right. When you walk into the pub, get ready for an impressive sight of 50 taps and over 100 different bottled beers. This is a zestful neighborhood pub with a dark wooden bar and additional seating out on the front sidewalk. You’ll find Belgian Strong Ales, American microbrews, Doppelbocks, and even the standard yellow lagers. Grab a tasty brew and a picnic table on the attractive side patio (check out the beer tap fountain), and then make a run across the street and to the Big Fisherman seafood store where you can buy delicious boiled crawfish for an unbelievably low price per pound. A big pile of boiled mudbugs (crawfish) and a glass of Abita Andygator Doppelbock at the Bulldog will be a lunch or dinner you won’t soon forget. 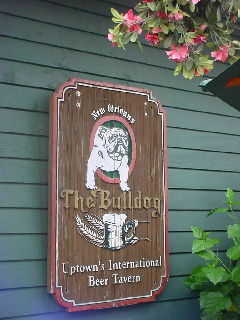 The Bulldog also features video trivia and happy hour Monday through Friday from 5 to 8 pm. All the food here is made to order, and the menu includes grilled items, sandwiches, New Orleans specialties and quesadillas. When ready to start the walk back to the streetcar, you should buy one last beer and pour it into a plastic cup at the door to take with you. This is perfectly legal in New Orleans! After you’re done at the Bulldog, walk back to the streetcar the way you came and board on the far side of the tracks (you’ll have to give up another $1.25). You want to continue on the streetcar away from downtown New Orleans to the Riverbend stop. This stop is immediately after the streetcar makes a 90 degree turn onto Carrollton Avenue. Step off the car, turn right, and walk across St. Charles one short block to Cooter Brown’s famous beer hall on the left. 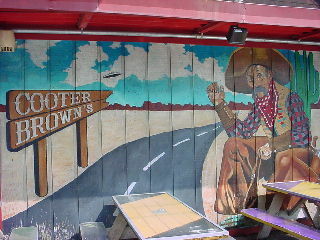 For the beer lover in New Orleans, Cooter Brown’s is an institution. If a beer is distributed in New Orleans, you can probably drink it at Cooter’s. Drink lots of water too so you won’t dehydrate, and be sure to sample some of the high gravity beers available on draft and in bottles. The tasty pub grub features burgers, seafood sandwiches, muffalettas (a New Orleans original sandwich with olives and cold cuts), and the best raw oysters you’ll ever let slide down your gullet. There are pool tables and video poker machines near the back bar, and be sure to check out the comical, celebrity sculptures displayed around the place -- each one holds a beer that fits his or her stereotype. This tavern opens daily at 11 am. Even though you could easily spend all afternoon at Cooter’s, keep in mind you have many more wonderful beers waiting elsewhere. Exiting Cooter Brown’s, walk back to the streetcar stop and board the car on the other set of tracks, heading back to downtown. Its final stop will return you to Carondelet at Canal Street (where you boarded at the very start of this pub crawl). Walk to Canal Street and turn right. Saunter several blocks down to the end of Canal Street where you will find the entrance for the ferry that will take you on a short, free trip across the mighty Mississippi to the village neighborhood of Algiers. Once across the river, exit the ferry station and head two blocks south on Bouny Street to the corner of Pelican Avenue. Here you will find the best (and only) English pub in Algiers – The Crown and Anchor. This friendly neighborhood pub features a couple of standard English ales on draft as well as a selection of bottled beer, single malt scotch, and pub snacks. The walls and ceilings are filled with UK pub items collected over several years, and there are two dart lanes across from the bar. With the friendly bartenders and talkative locals who frequent this pub no one stays a stranger long at Crown and Anchor. The pub opens most days roughly at 4 pm (it’s advisable to call ahead before making the ferry trip). Don’t lose track of time at this pub, as the last ferry departs back to Canal Street in downtown New Orleans in the early evenings. A new location of this national brewpub chain has opened in downtown New Orleans in 2005. It features delicious German lager beers and upscale bistro cuisine. Poydras Street is a very short walk west from Canal Street. Now return to Canal Street, walk north, and take a right onto Decatur Street. Stroll about four blocks to the original brewpub in downtown. Crescent City Brewhouse’s head brewer, James Hudec, produces light-bodied beers that are mostly German in style -- usually including a Pilsner, a Vienna-style Lager, a dark lager, a wheat beer, and a seasonal selection. This brewpub was started in 1991 and brews around 2,000 barrels a year. The beers are mostly clean and tasty but not very heavy -- this tends to suit the usual hot and humid climate of New Orleans. By now you should be quite hungry, and you’re in luck that Crescent City offers some of the best food in the French Quarter. 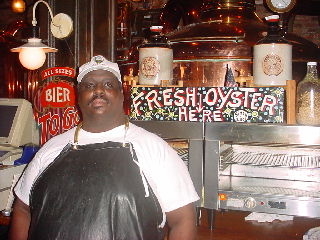 The baked oysters, steak, and fish dishes are all delicious, and for entertainment you can watch friendly Vernell, the oyster shucker, do his magic downstairs at the main bar. The two-story pub is absolutely beautiful with giant copper kettles, a gorgeous front bar, and a lush courtyard out back for cooler evenings. Live New Orleans jazz fills the front of the pub on some nights, and there are even beer taps at a small bar station that faces the sidewalk, so thirsty folks walking by can get a homemade beer to go. Crescent City is the perfect place to fill your eyes with great decor, your ears with jazz, and your stomach with local beer and cuisine. Call ahead to see if they are opening for lunch on the day you'd like to visit. Ready for a little more flavor from the British Isles? Leave Crescent City Brewpub and walk right to the next street (St. Louis). Go right on St. Louis and you’ll shortly see Sean Kelly’s on your left. 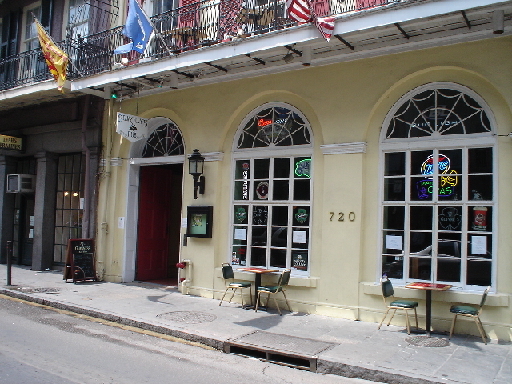 This new Irish Pub opened in the French Quarter in February of 2006 to fill the gap left by the closing of O'Flaherty's after Hurricane Katrina. At present they are only open in the evenings on M-F, but lunch and dinner hours are kept on Saturday and Sunday. Mr. Kelly is a native of Ireland and has been happy to open this friendly, personable pub in the French Quarter. Many of the former employees and musicians from O'Flaherty's now do their thing at Sean Kelly's. You'll find fresh Guinness and five other draft beers here, and the mainstream bottled beer selection should be expanding in the months to come. The attractive pub has a green walled front bar with a music stage just inside the front windows and a large back gameroom with two pool tables, two dart lanes, video games, TVs and table football. The food menu offers fish-n-chips, Irish Stew, pub melt sandwiches, hamburgers, wings and salads. Sean Kelly's is the perfect spot in the French Quarter to relax with a silky pint of Guinness and some Irish tunes late into the evening. Exiting Sean Kelly's, walk back to Decatur Street and take a left. Just over six blocks away (past Jackson Square and Café Du Monde coffee shop), you’ll find Sidney’s package store on the left next door to the famous Central Grocery muffaletta shop. When you enter Sidney’s turn your attention to the beer cooler on the right side of the store and the beer shelves that run along the back wall. This place has an awesome array of British, Belgian, American, and German beers that will surely make your mouth water. Grab a beer out of the cooler and get a ten cent plastic cup on your way out the door. Walk around the French Quarter sipping your beer -- could life be any better than this? Turn left from Sidney’s with your to-go cup and head straight down Decatur Street past Jimmy Buffett’s Margaritaville Café and the open-air, historic French Market on your right. Still on Decatur, cross Esplanade Avenue and in one block bear left on Frenchmen Street. Within two blocks on your left you’ll see the New Orleans branch of d.b.a. pubs (the other location is in New York city). Many people claim that d.b.a. has the best and most intelligent beer selection in New Orleans. This funky pub is loaded with local flavor, and the impressive chalk board beer list behind the bar boasts 20 drafts and 75 bottles. Happy hour is everyday from 4 pm (opening time) to 7 pm and gets you a dollar off any bottled or draft beer. The pub also has a pool table, killer jukebox, and occasional live music in the evenings. UPDATE: In a recent trip back to New Orleans in June of 2007, we found two new bars on Bourbon Street that had quite a few specialty beers for sale. These bars seemed quite promising, but their promotion of custom beer chugging funnels is a bit suspect. Check them out and see what you think.